Celebrate New Year's Even on the beach! A family-friendly countdown at 8pm culminates with fireworks, live music and 10,000 beach balls being dropped over the crowd. As the seconds tick down to midnight, thousands watch the Celebration Tower as a glowing beach ball descends to signify the start of a New Year and kicks off a second round of fireworks! 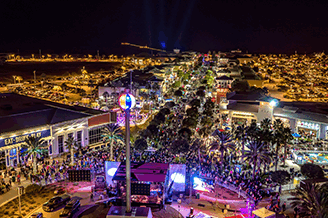 Say goodbye to 2018 and hello to 2019 with a great family-friendly celebration at the New Year's Eve Beach Ball Drop in Panama City Beach on December 31. The streets of Pier Park are closed off to traffic as thousands of revelers enjoy free live music, entertainment, and good cheer. For young revelers, there's even an 8 p.m. countdown, with over 10,000 inflated beach balls dropped from nets stretched over the street, followed by fireworks. On the way to midnight, bands perform for the gathering crowd, anticipating the countdown to 2017 when a huge, glowing beach ball is lowered to signal the start of the New Year, and another great fireworks display. Time Square has nothing on this Panama City Beach NYE party!